I do not know how those who mourn without hope are able to function. The desperation of the heartache must be unbearable. My mom met Jesus on Wednesday, and even though I know I will spend eternity with her, I’m utterly heartbroken. Since my dad died in 1999, I have called my mom every single day. In the early years, I never missed a day. More recently, I’ve let a few days here and there slip by, but that was the exception. She knew about the day-to-day details of all five of us. 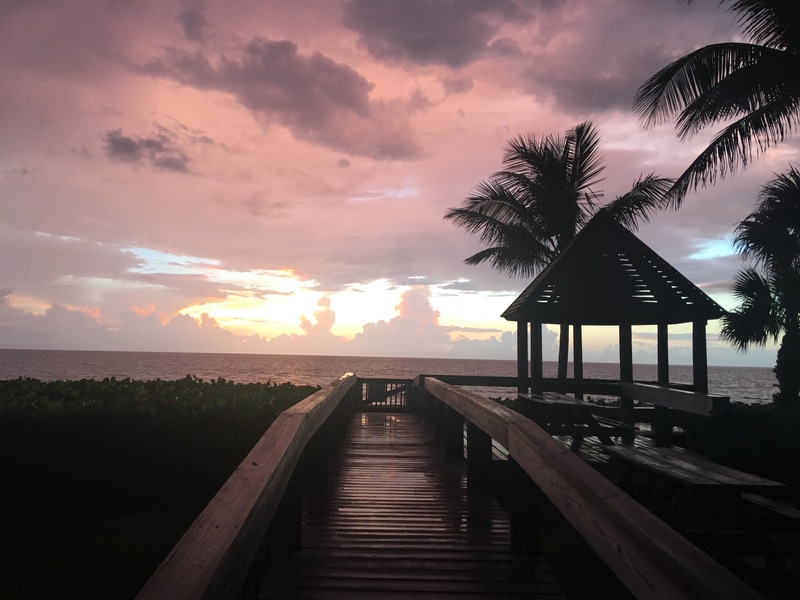 She’d listen and guide and pray over issues at Will’s work, the boys sports and activities, Sammy’s intense hatred of fourth grade and any and everything in between. She prayed specifically — knowing how I love to laugh — that I’d find a funny friend in Tennessee. The week before she died I called her while in the car with my very funny friend, Ana. She said, “Are you with your funny friend?” Yes, I told her. When we hung up, I told Ana how my mom had prayed her into my life. My house has horrible cell phone reception. The best place to not drop calls every other second is on the front porch. I cannot tell you the hours I’ve spent chatting and laughing with my mom on this little bench. The sight of it breaks my heart. I called her whenever I was out running errands too. I can hear her laughing saying, “Costco again! ?” But as much as I’ll never ever get over not seeing her or talking to her again, I’m so happy for my mom. She’s not struggling to breathe anymore, and she’s with Jesus and all of the many loved ones we’ve lost. I could tell you a thousand different qualities that made my mom special, but instead I’ll paint a picture of just one aspect of her. I flew to Michigan on Sunday evening, knowing my mom was not doing well. That night she slept in her recliner, where she felt she could breathe easiest. I slept on the couch across from her. All I had to do to check on her was open my eyes. On Monday, we had a hospital bed delivered and she slept peacefully there, and I slept in the recliner beside her. But in the morning, she said she liked the chair better. So that night, she slept in her recliner again and I slept in the hospital bed beside her. Every night, as we played musical beds, she’d tell me who we needed to call the next day. She was too weak to talk much but she wanted to call people and tell them that she loved them. She wanted them to be sure to know how much they had meant to her. In her last moments, her priority was loving others. I’d call and put the phone on speaker and together we had the most incredible conversations. Even in the middle of her last night, she called out to me names to add to the list. On Wednesday she woke up with a stronger voice and we had coffee together. For a few minutes, she seemed to be alright and then she suddenly took a dramatic turn. My sister Laurie was in the other room, so I went and woke her. My brother was on a flight to Detroit and she desperately wanted to see him. He walked in just minutes before she passed into an unconscious state. Looking up at Jeff as he bent down to kiss her was the last thing she saw. God was undeniably in the details. We live in three different states, but we were there with our cherished, incredible mom when she passed peacefully into the arms of Jesus. Today I am filled with gratitude that I am the daughter of Judy Huber — what a privilege. Humbled to know that I am also the daughter of the One True King, and that we will live together forever in eternity. Praising Him from Whom all blessings flow, and cherishing the promises of His Word. May we all be ready for the trumpet to sound! Do you ever see a quote on Facebook or Instagram, or really anywhere, that just speaks to you? You think, “Ain’t that the truth!” I’m always struck by how these little a-ha lines can invariably be traced back to the wisdom of the Bible. Solomon was right: there is nothing new under the sun! Try to find one that isn’t at least implied in Scripture. I bet you can’t. This morning I was folding laundry and came across this awesome shirt. The five pillars of Coach Tony Bennett’s basketball team: Thankfulness, Humility, Passion, Unity, and Servanthood. What great principles to live by! What a perfect way to summarize the admirable goals of Bennett’s team. But aren’t these great pillars for life, too? “Give thanks in all circumstances; for this is the will of God in Christ Jesus for you.” 1 Thessalonians 5:18. Praying this morning that I’ll live by these pillars, teach them to my sons, and give God all the glory. And hey, if one of my sons ends up playing at UVa for Coach Bennett then I’m good with that too. Real good. Go HOOS! Do you ever know deep in your soul that God has orchestrated certain details to show you He loves you? I hope so. It’s a kind of knowing that is invariably cheapened by sharing, and yet the compulsion to share is overwhelming. You might tell your friend or spouse, “This amazing thing happened…” And yet you know despite sincere efforts to appreciate all that you convey, it’s just not possible. The symphony of events and thoughts and words and scenery were for you and you alone. It’s in those kinds of moments I know Jesus truly is my best friend. Because He gets it. I don’t have to explain it. Or give any kind of disclaimer like, “I know this might sound like I’m reading into this…” He knows I’m not. He is the author of the symphony and He delights in my recognition and appreciation of it. Yesterday I had a day drenched in sacred little moments. But I’ll tell you only about one of them. I tagged along on a business trip to D.C. with Will. As an aside, if at all possible, always fight through the feelings of “this couldn’t possibly be worth it” and arrange the 6 Billion details of leaving. We walked around the National Mall at sunrise and then he went to his conference. I grabbed coffee and my Bible and sat in a beautiful courtyard. I read a few Psalms and wrote in my journal. Then I read a devotional published by The C.S. Lewis Institute called Reflections. Here is the link but in summary Lewis convincingly argues that a failure to praise God results not just in missing out on life’s greatest experience, but ultimately our ability to enjoy any blessing is diminished. A failure to praise Him means we miss out on everything. I packed up my stuff and headed back out walking. 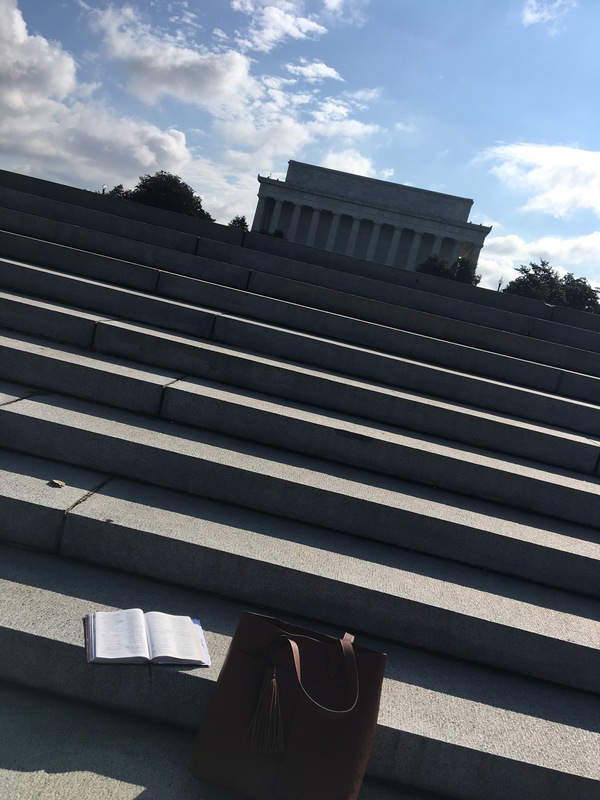 On the steps behind the Lincoln Memorial, I opened my Bible again and read Psalm 116. Then I headed for the National Gallery of Art, straight up Constitution Avenue. But the sidewalk was closed. The detour took me right beside David’s Tent. I had looked for it near the Washington Monument where it had been when I left the D.C. area in 2015. I was stunned that this detour caused me to stumble upon its new location. If you’ve never heard of it, it is a tent where Christians praise God through worship music 24 hours a day, 365 days a year. They have Bibles and people to pray with you as well. I don’t know exactly how long I stayed but it was more than just a few minutes. I kept thinking, “I’ll leave after this song.” But then I’d love the next song too. I could not make myself leave. Then the musician leading worship began strumming a song I knew but somehow didn’t expect to hear. Years ago the song was used in various churches as the inspiration for a drama, but I’ve never sang it as a congregation, never sang it with anyone besides my brothers and sisters in Christ at David’s Tent. The song? Everything by Lifehouse. And how can I stand here with you? And not be moved by you? Would you tell me, how can it be? Any better than this? ‘Cause You’re all I want, You’re all I need. You’re everything, everything. It just doesn’t get any better than that. He’s all I want. He’s all I need. He’s everything. Everything. Praying as I fly home to my sweet boys that you have even the tiniest appreciation for this symphony of grace God gave me yesterday and that you recognize and give thanks for the symphony of grace He is orchestrating for YOU today. These are words to live by during these dark days. None of these storms or quakes or fires have caught God off guard. He knows the troubles we face. He knows how many hairs are on your worried little head, and mine too. But take heart! This life isn’t all there is. Jesus has overcome the world. He’s gone on to prepare a place for those of us who have given our lives to Him. This whole life — whether hard and full of sorrow or privileged and marked by ease — is a blip on the screen of eternity. The whole goal is to know Him, praise Him and give Him glory — to reflect Light in the darkness as best we can. Praying today that just like the children’s song, no matter what my circumstance, that I’ll be faithful to let my light shine. Let it shine. Let it shine. Let it shine.